In the film and television industry, members of individual art departments are often known by their team names. When your team name is mentioned, most crews immediately known who is on that team or particular group. 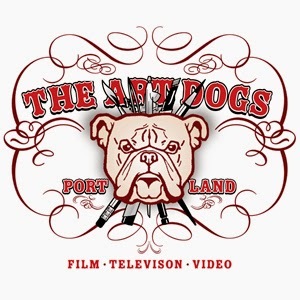 In the film industry, there are the Art Rats, The Art Scum Dogs of Austin, Bat Rats, Crooked Artists of Art, Jersey Art Choir and of course The Art Dogs of Portland. Original started in 1999, The Art Dogs had maybe 3-4 loose team members, including James Eubank, Todd Brooks, and myself - Tim Oakley. Today, the Art Dogs has capped off at 5 core members - most recently adding John Kirkley. These are the ones that not only work well together as a team, but so as individuals. And with ever team, you need a team logo to represent you on set. Although a rough image was designed about 2-3 years earlier, this past summer I finished up the new and improved Art Dogs image. To be used on t-shirts, hoodies, and stickers, the image showcases a bull dog's rough tough style of determination that every of the art department goes through when creating a set, prop, graphic or anything alike for films, television or video. And as every art member knows, you also need to know your tools - even the simplest & basic art tools. Which, in this case, backups the bull dog head. We wear this image with pride on set. And, as we say on the start of each day - Art Dogs Rule! Oakley Design® is known for its originality, fun creative typography, conceptual design, and use of color. For more information, call 971.221.5023.